The original recipe was taken from McCormick.com; however, I changed it up a little bit flavor-wise and to lower the calories. 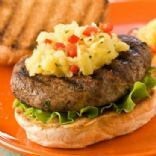 .Get a feel of the islands while enjoying grilled turkey burgers topped with a fiery pineapple salsa. Found this recipe in Woman's World magazine. Zesty, moist turkey burgers with a zip! Delicious on the BBQ or a George Foreman Grill. Very filling, but still healthy. I top them with green chiles for extra spice.